If you don't know what asparagus is and you get to try some you are in for a treat. Asparagus is a tender succulent, flavour-some vegetable that is most simply eaten lightly steamed with melted butter. The Asparagus plant grows from a root stock that dies back each year and the part that is eaten are the first young shoots that come up in spring. Theses Asparagus Tips as they are known are incredibly tender and delicious. As you will see from the rest of this site there are lots of ways to cook and eat this vegetable and we provide all sorts of information including how to grow it and all sorts of facts you might otherwise never know! Read on for a bit more about what Asparagus is. the succulent young shoots of A. officinalis, which may be cooked and eaten"
" A plant ( Asparagus officinalis, family Liliaceæ) cultivated for the sake of its vernal shoots, which form a well-known delicacy of the table. Bot. The genus which contains this among many other species"
The scientific classification is alluded to in the dictionary definitions. The vegetable we know as asparagus is the young shoots of Asparagus Officinalis L.
The gardener's will be interested to know that the garden asparagus is a perenial plant that lives for many years (in good conditions typically 15 years or more) with young shoots growing form a crown or tuberous root system each year and developing into a tall wispy fern each year before dying back in the autumn. It can take some time and patience to get a good asparagus bed growing but it is well worth the wait. Asparagus is at its best as a fresh vegetable. As already explained it is the young shoots of the asparagus officinalis plant and is in season in the spring (April to June in the UK). Locally bought produce eaten just after cutting has a very distinctive flavour advantage over imported produce but imported produce is now available year round in Europe and North America typically from Peru, Mexico and occasionally Thailand. The fresh produce is harvested and sold when the shoots are between 6 and 10 inches in length and range from slim , 0.5cm - 1cm to around 1.5 cm in thickness. How thick the shoots are is not an indication of quality or flavour with different varieties having different thicknesses and all sizes coming with great flavour. A well closed tip that has not started to flower is favoured, as are straight stalks but you may pick up a very flavoursome bargain if you find a supply of "wonky asparagus" that the supermarkets don't want! Cooking asparagus is easy but there are lots of different ways to cook it and many many recipes to try out. As well as green asparagus some varieties come with a purple colouring and these can be very sweet. You may also come across white asparagus (especially on the continent), this type of asparagus is grown from the same varieties of asparagus as the green produce but by a different growing process. Earth is mounded up as the shoots grow depriving them of light such that they are then harvested whilst still white. This type of asparagus is very popular in Germany and usualy needs peeling. Finally you will also find canned asparagus, both green and white. Ultra thick white asparagus is sold as a premium product and attracts a premium price. 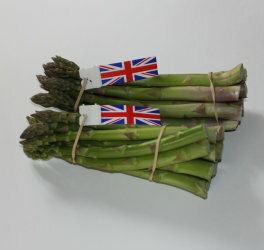 Whilst fresh green and purple asparagus are widely enjoyed the appreciation of white and canned varieties are subject to more regional variation.